Your Daily Dose of Sabino Canyon: Out of the bag! 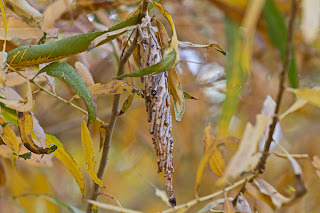 I've posted about Bagworms before, but I didn't know they were so ugly in the caterpillar stage until Christmas day in the afternoon, when I was walking in the riparian area above the dam with my family. Inspecting the willow with multiple bagworm bags, I saw a maggot-like caterpillar come about a centimeter out of the top of the bag and proceed to crawl - very slowly - with the bag still hanging down. Of course, my photographer daughter was busy taking the 'follow the water' photos, and didn't hear me shouting. Jean and Mark and company came along, though, and I was sure they'd be able to confirm my sighting. As I called them over, gesticulating frantically, I either created turbulence or brushed the branch ever so slightly. In any case, the caterpillar pulled the bag back up and pretended to look like a perfectly stationary bagworm bag. Sigh. Here's basically what I saw, albeit vertical.